AutoCAD Troubleshooting: Ribbons and/or Toolbars Missing? After opening AutoCAD, or while using the software, the ribbon and toolbars are no longer displayed?.... What can I do? AutoCAD's Ribbon and/or Toolbars have disappeared, and are no longer showing up on screen. Disable the Clean Screen Feature - The clean screen feature maximizes the drawing area by hiding features such as the ribbon, toolbars and palettes. You can toggle the Clean Screen feature by pressing CTRL+0 (zero). If the command line states "CleanScreenOn" you will know it's currently active. Press CTRL+0 once more to disable this feature. CLICK HERE for more information. Turn on the Ribbon - The ribbon may have been shut off accidentally, or disabled. To restore the ribbon, type RIBBON in the command line and press Enter. If the ribbon is still missing, the view mode may need to be adjusted. Click the button at the right corner of the ribbon to cycle through the panel viewing options. Change Workspaces - Switch to a different workspace, and then back and see if the ribbon/toolbars reappear. CLICK HERE for more information. Turn on the Toolbars - In the command line, type -TOOLBAR and press Enter (or click the Tools menu and select Toolbars). Additionally, you may need to change the MENUBAR system variable to 1. CLICK HERE for more information. Restore AutoCAD to Default Settings - You can reset AutoCAD back to the default settings when originally installed. CLICK HERE for more information. Uninstall, then Reinstall AutoCAD - You may need to do a complete uninstall, then reinstall of AutoCAD. 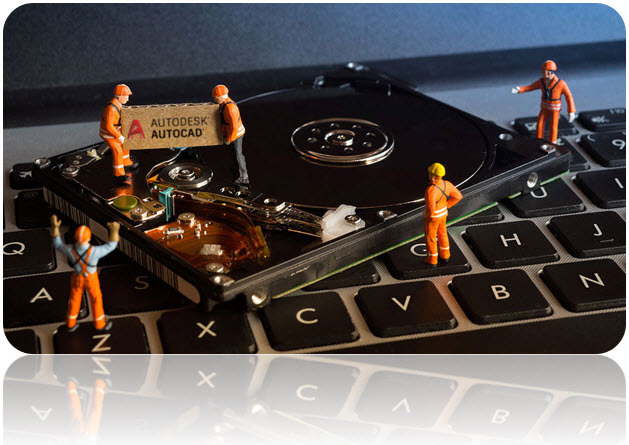 For information on how to completely uninstall AutoCAD - CLICK HERE.